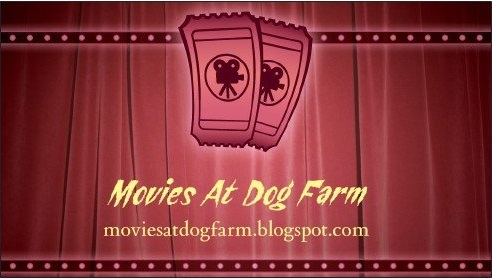 Is it weird that I just ordered these nifty new business cards to promote my non-monetized movie blog? Me: "I've got a web page about horror movies and stuff. You should check it out. Here let me give you the info . . . "
. 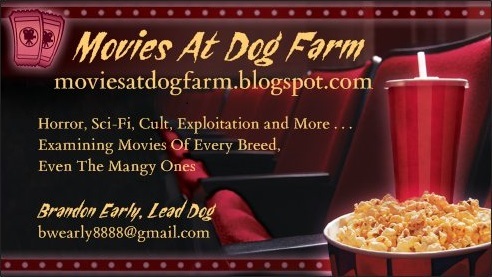 . . pats down pockets as though looking for something, then produces a nifty new business card and presents it with a theatrical flourish to the potential Dog Farmer accompanied by . . .
Me: "BAM! My card! See you on the internet!"
. . . and the potential Dog Farmer walks away suitably impressed and makes a mental note to check out Movies At Dog Farm as soon as possible . . .
. . . and that's why nifty new business cards. Nothing weird about that, right? I've got some news about some Friends Of The Farm, too. J.D. over at Blood Sucking Geek has introduced Forums on his site. Check 'em out, and be sure to sign up so you can contribute to the discussions. Rachel just did a redesign of @Fake_Shemp, and she was geeking out pretty hard today about Peter Capaldi being chosen to be the new Dr. Who.
. . . and finally, I had the pleasure of meeting author, illustrator, and educator Rich Hilliard right here in my own back yard this week. We geeked out about Beyond The Valley Of The Dolls (1970), Fulci and Argento, and horror movies in general. Rich is a fantastic illustrator, and you can check out a few of his galleries (including a Classic Monsters gallery) at richhilliard.com. And I refuse to stop. I woke up this morning (after 2 hours sleep... seriously check my twitter feed... I've had no sleep) with the lovely notion that Peter Capaldi is the next Doctor. and I love the idea of blog business cards, bet you aint the only one. You know, I was just thinking about business cards, myself. I just can't find the right graphics and stuff, although I do have the extra-talented husband to figure out that stuff for me. I got business cards and t-shirts when I started the Zombie. The important thing about them is to have them when you network. The second important step is that you have to network. 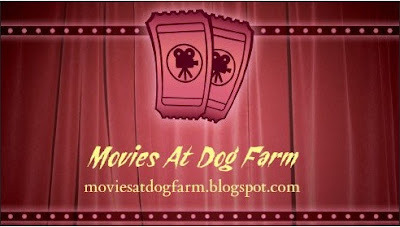 Visit local conventions, events, and stores to circulate the cards and get the word out on The Dog Farm. Any chance you can mail me a handful of cards to spread here in South Florida? Should I be watching Dr. Who? It's one of those things like Dark Shadows that's been around so long I feel as though I wouldn't know where to start. The closest I've ever gotten is a desire to see the two Dr. Who films starring Peter Cushing, though I understand they're not considered canon. Bob, I'm sure the hubby can whip you up something good. Obviously, what I used was just a generic template. I checked several different places, and this was the best template option I found. Many were simply too busy to see the text on or too plain. Thanks for the shout out Brandon! And I'll just jump in on the Doctor Who question...YES, watch it. I just read some Cliffs Notes and pick it up with the new guy? Carl, you absolutely will be getting a fist full of cards. I actually work in an electronics store, movies come up a lot, and I was beginning to embarrass myself writing the pertinent info on scraps of paper. That's actually how I met Rich Hilliard. I was already planning on sending them with your copy of the Halloween Monster Mix. I'll probably be getting those to you in early September (just when the season starts to change here in Virginia). Unrelated note: I just got tickled by the fact that I've been typing these comments one handed all afternoon because I've been holding Gunnar with the other hand. I'll be trying to get a guest post out of him soon. I'm thinking he can rate movies using one to four "loaded diapers".